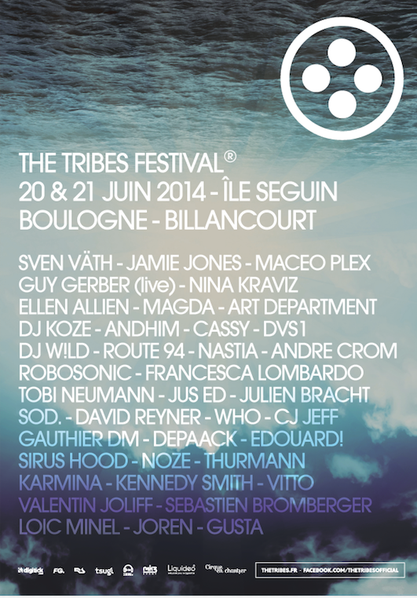 French promotion team The Tribes is to put on its first ever electronic music festival in Paris between 20-22 June with an array of headliners from the worlds of house and techno. The venue is Ile Seguin, an island just ten minutes from the iconic Eiffel Tower, meaning the festivities will play out in the landmark’s shadow, with Paris as the backdrop. The small island is an urban industrial estate surrounded by the Seine that will make for an ideal place to play with 10,000 other people. The Tribes is known for underground parties in Paris with brands like Circo Loco, Mobilee and Jamie Jones’ Paradise, all of whom are involved at their first ever festival. Across all days, the event will make use of four dancefloors, inside and out, offer more than 40 international artists and will ensure food, dancers, performers, a chill out area and much more are on site to make things as best as possible. Headlining the three days will be; Cocoon boss Sven Vath and label mate DJ W!ld; Hot Creations chief Jamie Jones and Ellum Audio honcho Maceo Plex; Rumors and Supplemental Facts boss Guy Gerber; No 19 house pair Art Department; Rekids temptress and techno talent Nina Kraivz; BPitch Control’s Ellen Allien; Pampa founder DJ Koze plus Underground Quality main man and Jus-Ed. Howdy I am so delighted I found your website, I really found you by error, while I was searching on Google for something else, Nonetheless I am here now and would just like to say thanks a lot for a marvelous post and a all round thrilling blog (I also love the theme/design), I don�t have time to read through it all at the moment but I have bookmarked it and also added in your RSS feeds, so when I have time I will be back to read a lot more, Please do keep up the excellent b.